Yep, it's that time again. Another Audiobook Roundup. This time, I'm going to post about some audiobooks that I'd recommend for families with elementary school age kids. I thoroughly enjoyed all of these and I think both kids and adults will get a kick out of them. So if you're looking for something to spice up a road trip or recommend to those families taking trips, look no further! Millions by Frank Cotrell Boyce. Fourth grader Damian might not be the smartest boy in school, but there are two things he knows for sure. Firstly, he knows everything about saints. Secondly, he knows that if he ever wants something, all he has to do is remind people that his mum is dead and he will be given something. When a bag full of money falls out of the sky three weeks before England's switchover to the Euro, Damian thinks the money must have come from God. He tries to think of a saintly way to spend it, however big brother Antony has other ideas. What follows is a rip-roaring spending spree interspersed with hilarious and touching moments. George's Marvelous Medicine by Roald Dahl. George's grandmother is really evil. She's so nasty to George that George decides to mix up his own medicine for her in the hopes that it will blast the nastiness out of her (or make her explode... whichever). He puts everything in it from motor oil to shampoo to sheep medicine and spices from the kitchen. When he gives it to granny, surprising and amazing things start to happen. 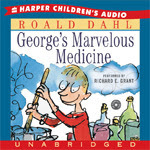 Narrator Richard E. Grant has a fantastic grandma voice and kids and adults alike will be astonished by the things that go into George's marvelous medicine. The Miraculous Journey of Edward Tulane by Kate DiCamillo. A cold-hearted china rabbit is lost on a family vacation and goes through many different hands and homes until he ultimately learns how to love. A word of warning: parts of this book are quite sad. However, it has excellent narration. Judith Ivey does great voices for all the different characters. It's really quite amazing that one person can make all those different voices. 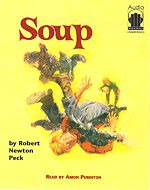 Soup by Robert Newton Peck. This story was a favorite of mine when I was in elementary school. It's set in the 1920s and third-grader Rob has many adventures with his rambunctious friend Soup. Another funny book, Rob's escapades will have you giggling all the way to grandma's (or wherever you're going). A word of warning, there's some content that might be questionable. At one point Rob and Soup make acorn pipes and try smoking... at another point they're discussing the only Jew they know, the guy who runs the local junkyard and is purportedly liable to cheat you. Hopefully these scenes will spark a discussion, but they may upset sensitive parents who aren't expecting them. 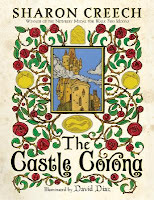 The Castle Corona by Sharon Creech. A thoroughly enjoyable audiobook, especially for families who love fairy tales. Narrator Jennifer Wiltsie gives each character a distinct voice, which is especially noticeable when two of the characters are having a conversation or interrupting each other. Jaunty music starts each disc and adds to the story rather than distracting from it.